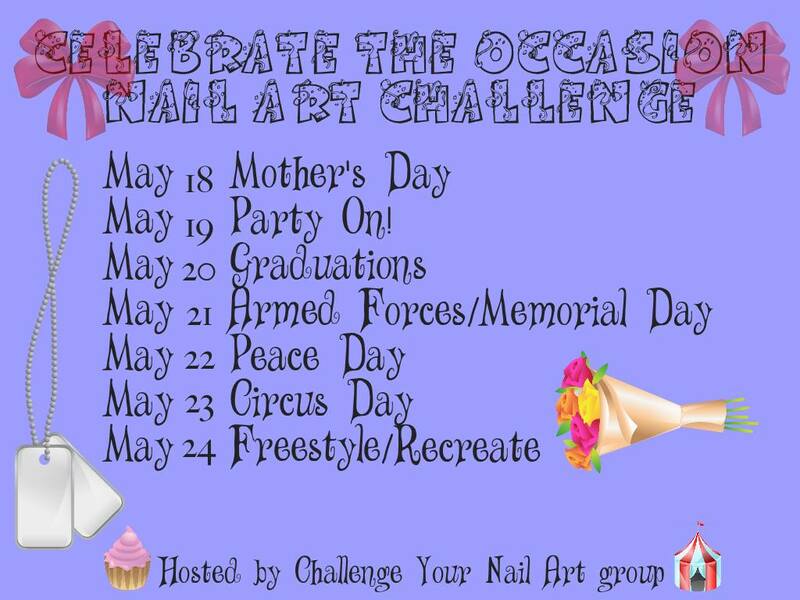 When I started preparing for this challenge, I starting thinking about nail art like mortar boards and diplomas. Then, I realized I had the *perfect* nail art to show you. A few weeks ago, one of my friends graduated with her Masters' degree, and the day before the big ceremony, she had a little party. I did a few manis for the graduate and her friends and family, and in return, I got to eat some of the best grilled chicken I'd ever had. 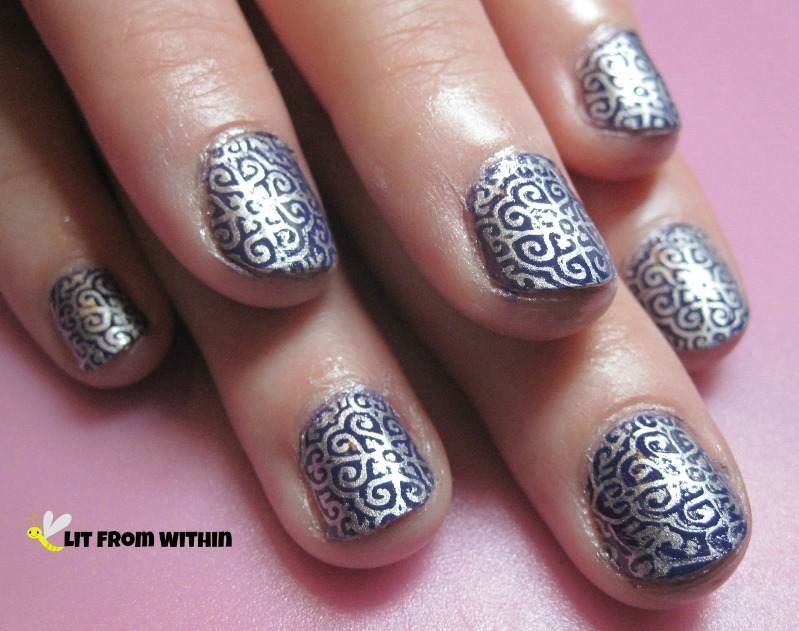 None of the girls had experienced stamped nails before, so most of them were eager to try it! Their reactions were priceless - like I had just done some wand-waving magic over their nails! The graduate, Chelsea, loves purple, so she chose Sinful Colors Enchanted as her base, and Essie No Place Like Chrome for the stamp. Our friend, Carolyn. 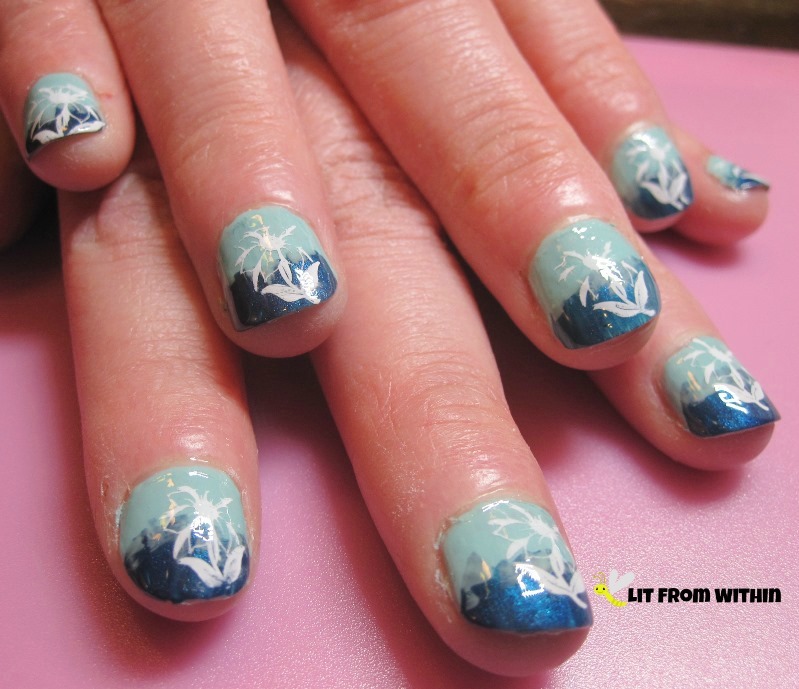 wanted seahorses over a glittery blue base, so I used Sally Hansen Insta-Dri Blue By! with OPI In True Stefani Fashion for most of the nails. Again, I used Essie No Place Like Chrome for the stamp. Sea horsies! 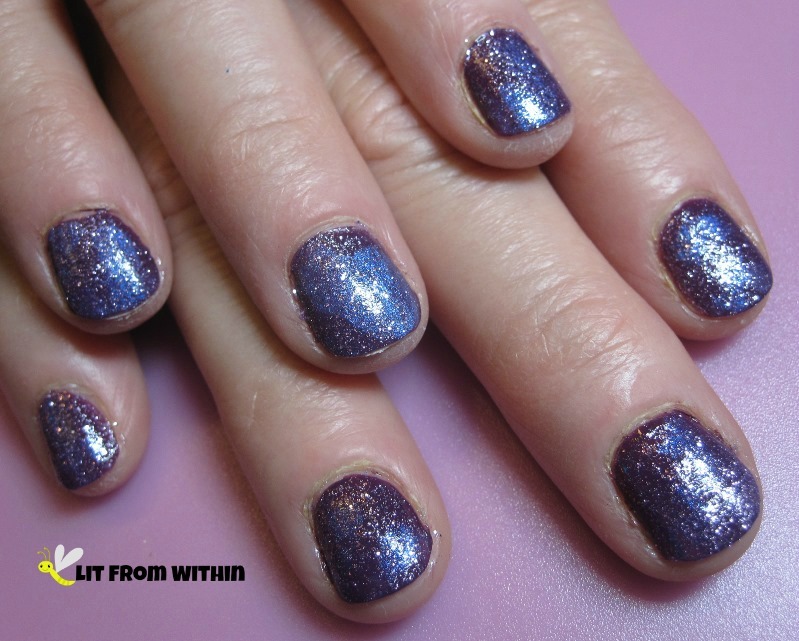 The Mother-of-the-Graduate had a gorgeous floral blouse with blues and purples, so I painted her nails with Sally Hansen Salon Trouble Maker, a soft blue-toned violet, and dabbed some L'Oreal The Shift Me, a pink iridescent color-changing topcoat over it. POP Beauty purple glitter went over everything. So festive! Last, but not least, was the Graduate's sister. She wanted a gradient, but I forgot my sponges, so I did a dabbing gradient of Sally Hansen Insta-Dri Jumping Jade (which is really more teal to me, than jade..) over Sinful Colors Nice Stems, a light blue. I used Milani White On The Spot to stamp some simple flowers. It felt great to give my friend a very unique and special graduation present! We all had a great time chatting and doing nails, and I'm going to miss her now that she's graduated! Very pretty! 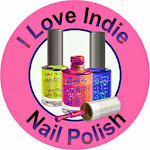 I love Chelsea´s nails! I loveee the first one. 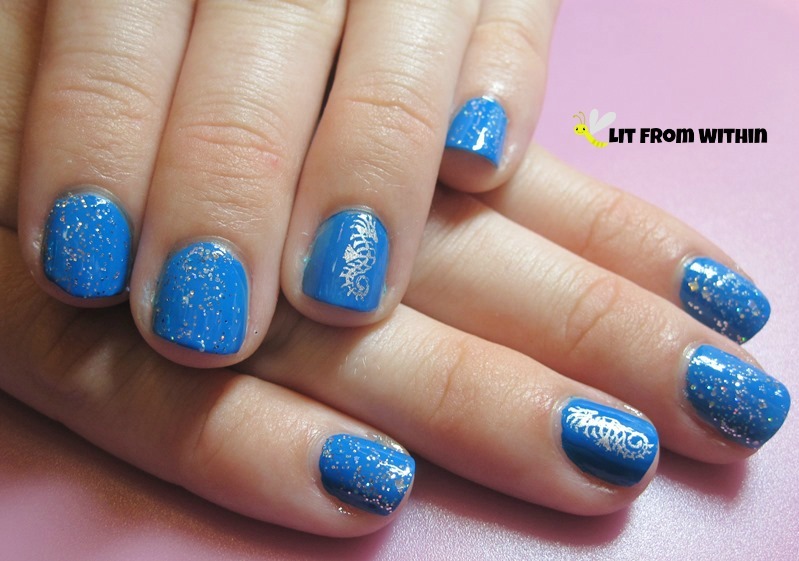 I'm sure your nail art is the highlight of the party! Lovely nails you have up there! Love all the different designs! I love the first one! What cute ideas! Totally going to pass these on to my cousin who is graduating soon! That sounds so fun! Nail stamping partaayy!!! Love love love these. Amazingness!!! I just love that first one, it's so striking! The first design is amazing but the others are cute too. I love the first design, too! The first mani is my favorite! I loved the sea horses best! OMG those sea horses are divine! So cute and different too. 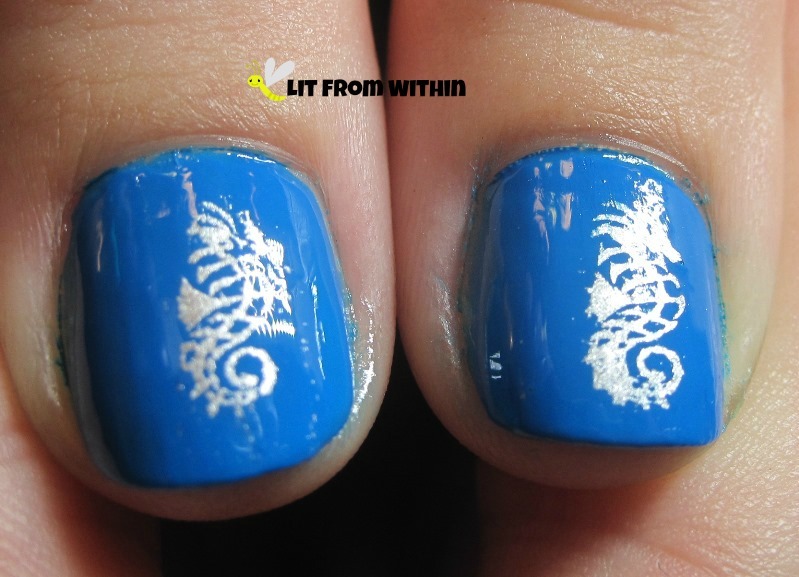 Seahorses are perfect for summer! Beautiful manicures! I love the seahorse stamp, it's so fitting for the season. How cute! Congrats to the graduates! Nice! I like them all. They are so unique. so cute! love the stamps!